The head of the Miniature English Bulldog should be large, but not exaggerated out of proportion to the body. Broad muzzled and short faced, but with a definite protrusion of muzzle. The face is measured from front of cheekbone to tip of nose, long enough for unhindered breathing. Muzzle is broad and turning up. Loose folds of skin across nose, but in no way excessively wrinkled. Undershot (but not to excess) to level jaw. Flews are broad and hanging over lower jaw at each side. Eyes are set low and wide, never bulging or sunken—preferably without visible haw. Eyes of any color are acceptable; however, blue eyes are undesirable. Ears are small to moderate size and set wide apart. Rose or button preferred; never erect. Mouth is broad jaw. Full dentition desirable with incisors a large as possible. Canines set wide apart. The neck is moderate in length; thick, deep and strong with loose skin forming small dewlap on either side. Chest is broad and deep. Shoulders broad, rounded ribs. Forelegs powerful and straight, not bandy or curved, well boned, set wide apart, but under the trunk, presenting a straight front. The back is short and straight giving compact carriage, but not so short as to interfere with activity. Ribs well sprung and deep. Hindquarters are strong and muscular. Hocks are slightly bent. The feet are round and compact. Excessively splayed feet undesirable. The tail is thick set at the root. Straight (long or short), crank, pump-handle tails all acceptable. Set high on rump, slightly rounding down. Screw tails acceptable, but tight screws undesirable. Docked tails definitely undesirable. Gait and movement are balanced and vigorous. As true (straight) as possible with drive from rear. The coat is smooth, short, and tight to the body. Acceptable colors are all brindles, solid white or pied, solid red, fawn or any combination. Fallow black not acceptable. 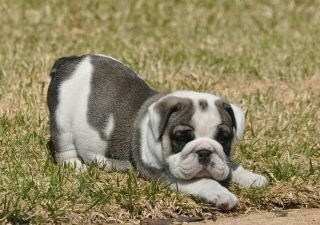 The Miniature Bulldog is an English Bulldog bred down in size. It is not a mixed breed. Loyal, extremely affectionate in nature. Extroverted and gregarious, this breed's happiness requires human attention. This breed is good with family pets, but can be scrappy with strange dogs and needs an owner who understands how to correct this behavior. Gets along well with children. May dribble a little after drinking but is not considered a big drooler. Tends to snore while sleeping. Bullheaded and determined, this breed can be very persistent. They do not give up easily. Bulldogs are very much a people’s dog, seeking out human attention and loving every bit it can get!! A lot of human attention is required for the breed's happiness. 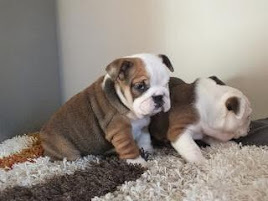 Some Miniature English Bulldogs can be a bit dominating and need an owner who knows how to display strong leadership and understands alpha canine behavior in order to raise a Bulldog that understands its place in the human pack, and is nice to, and reliable with all people. 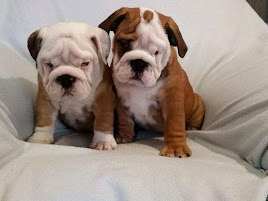 When Bulldogs are young, they are full of energy, but slow down as they get older. Breathing problems; some have small windpipes as well. Also poor eyesight, very susceptible to heatstroke in warm weather or hot rooms and cars. Very cold sensitive. Puppies often delivered by caesarian section because of their broad heads. Its digestive system is very active and may be offensive to people with sensitive noses. Susceptible to skin infections. Also hip and knee problems. The Miniature English Bulldog is good for apartment life. They are very inactive indoors and will do okay without a yard. This breed is an indoor dog. Bulldogs do best in temperate climates as the breed can chill easily in cold weather and have trouble cooling off in very hot weather. Some adult Miniature English Bulldogs would just as soon not take any exercise, while others are full of energy. In any case all Bulldogs need to be taken on daily walks to fulfill their primal canine instinct to walk. 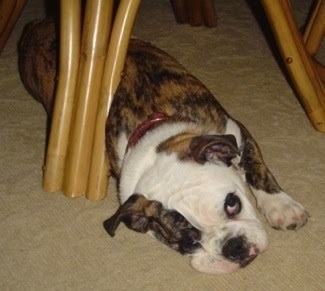 Fit English Bulldogs are capable of moving very quickly for short periods of time.